Tribal Art Asian Buddhist Exhibition is available to rent by schools and museums. Asian Buddhist Artifact shamanistic tribal buddhist rituals and monastic practice with Prayer wheels Buddha Statues Monks chanting tribes in primitive villages praying makes the Tribal Art Asian Buddhist Exhibition worth seeing a second time. THIS COMPREHENSIVE EXHIBITION EXPLORES BOTH MONASTIC, AS WELL AS, SHAMANISTIC TRIBAL BUDDHISM. THE MAJORITY OF EXCEPTIONAL ARTIFACTS IN THIS EXTRAORDINARY SURVEY WERE CREATED IN THE 18TH AND 19TH CENTURIES AND REPRESENT PRIMARILY: CAMBODIA, TIBET, THAILAND, CHINA AND BUTHAN. 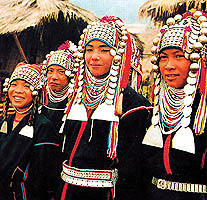 SEVERAL OTHER SOUTH EAST ASIAN CULTURES AND BUDDHIST SECTS HAVE BEEN INCLUDED IN ADDITION TO HILL TRIBE AND TAOIST FORMS OF RELIGIOUS PRACTICE. THE TWENTY PICTURES, INCLUDED AS SUPPORT MATERIALS, IN SOME INSTANCES DEPICT THE SHOWS' ARTIFACT EXAMPLE IN USE. 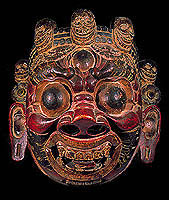 AN ASTONISHING PRESENTATION OF CEREMONIAL CHARACTER MASKS FROM BUDDHIST MORALITY PLAYS ARE FEATURE ALONG WITH EXTRAORDINARY EXAMPLES OF MAHAKALA AND BUDDHIST STATUARY. ETHNOGRAPHICLY REPRESENTED: TEXTILES, JEWELRY, HEADDRESSES, AND TRIBAL STATUS SYMBOLS ARE BUT A FEW OF THE UNUSUAL COMPLIMENTARY PIECES INCLUDED TO AUGMENT THE MORE CLASSIC EXAMPLES. THIS REMARKABLE SHOW OF BUDDHIST REGAL SPLENDOR, SHOULD NOT BE MISSED. THE DIVERSE COMBINATION OF CLASSIC AND TRIBAL BUDDHIST MATERIALS, MAKES IT POSSIBLE TO EXPERIENCE FIRST HAND, MAGNIFICENT ASIAN ART FROM ONE OF THE WORLDS' GREATEST RELIGIONS! INCLUDING STATUES, TEXTILES, HEADDRESSES, MASKS, AND SCROLLS. SQUARE FEET: 1200-1600 RENTAL FEE: $11950.